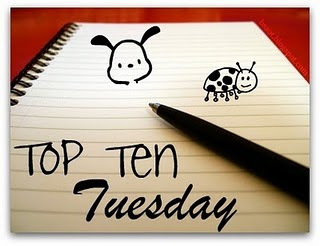 As ever, this week’s Top Ten Tuesday is brought to us by the good people at the the Broke and the Bookish. It’s been a little while since I’ve done one of these and, frankly, if it weren’t for the fact that I have hardly blogged at all in the past couple of months, I probably wouldn’t have bothered with this one. You see, I am really not a beach person. Don’t get me wrong, I love the sea and the seaside. I just don’t like the actual beach. I don’t like how the sand gets everywhere, I don’t like being surrounded by throngs of people and, being both naturally “glow in the dark” white and having a lawyer’s tan, I’m unlikely ever to be cast in Baywatch. Until the birth of mini-Falaise, I was always more of a city break kind of person. I would make exceptions obviously and remember having great holidays in the south of France and on Corfu with Mrs Falaise but have never really gone for the beach since childhood holidays in Cornwall and on the Isle of Wight. So, I can’t actually give you a list of favourite beach reads. What I can give you, however, is a list of books that I read on holiday and that trigger memories. 1. Poirot’s Early Cases by Agatha Christie. I loved Christie and especially Poirot as a boy (and, secretly, still do). Between the ages of about 8 and 11, our summer holidays were spent on the south coast of England, in places like Lyme Regis, Newquay and the Isle of Wight. One year, when I had just started reading Poirot, my parents bought me a copy of Poirot’s Early Cases. I was engrossed in it and can still remember being thoroughly sulky about having to put it down to join in with the rest of the family at the beach or on excursions. Happy days. 2. Midnight in the Garden of Good and Evil by John Berendt. When I go away, I like to take books that have a connection with the place I am going to. Some years ago, I had been going through a rather intense period at work and rewarded myself with a three week trip through parts of the USA, travelling by train. The longest stretch of travel was between Washington DC and New Orleans. I had my own little compartment and had a wonderful time watching the world go by and reading. One of the books I read was this one, as the train took me through Georgia on my way to the Big Easy. The book was amazing, the trip even more so. 3. Little Infamies by Panos Karnezis. As I mentioned above, I once spent a fabulous week in Cannes with the (then) future Mrs Falaise. We stayed in Hollywood splendour at the Hotel Martinez on the Croisette, one of the mainstays of the film festival. We enjoyed the private beach, on which we dined while watching the firework display. I also enjoyed relaxing by the pool, reading this collection of short stories, set in an obscure Greek village and focussing on the lives and deaths of the eccentric villagers. It has elements of magical realism, not my usual thing, but was wonderfully readable anyway. 4. Venice by Jan Morris. Venice is one of my favourite cities in the world. I’ve visited a number of times and never tire of it. If you are planning a trip or just want to visit it in your mind, this is the perfect companion. It’s not a guide book but is a superb portrait of this unique city. Simply brilliant. 5. Brideshead Revisited by Evelyn Waugh. I read this for the first time as a teenager on a family holiday to Tenerife. Although it is probably a bit overrated, I still think it is a beautiful depiction of love, loneliness and the slow decay of the old aristocracy. I enjoyed it but didn’t take a teddy bear to Oxford with me. After I’d finished it, I lent it to my father who returned it to me liberally smudged with his suntan oiled fingerprints. Git. 6. Astérix by René Goscinny and Albert Uderzo. As a child, I was never allowed to have any of the comic books telling the stories of the plucky Gaulish warrior and his sidekick, Obélix. My parents considered them not educational enough. I was, however, allowed to buy them if they were in the original French – that was considered just educational enough! So a highlight of family trips to France was my ritual purchase of a couple of new hardcover Astérix albums and the agonies of having to make choices between them. I still have them all in my library (aka the basement and mini-Falaise’s playroom). I hope that, in due course, she will get as much enjoyment from them as I have. 7. An Olympic Death by Manuel Vázquez Montalbán. I read this Pepe Carvalho mystery on a weekend break to Barcelona in 2000, just before starting a new job. Pepe Carvalho is a jaded socialist, gourmet private investigator who solves crimes in his native Barcelona. An Olympic Death is set just before the 1992 Olympics and contrasts the old, earthier Barcelona with the glossy, glamorous Catalan city that sprang from the Games. I often think that Montalbán gets unfairly overlooked in the Euro detective novel stakes and is definitely worth checking out. 8. Cairo: the City Victorious by Max Rodenbeck. A sweeping survey of life in Cairo from the very beginning, through its medieval glories to the end of the twentieth century. I read it in Cairo, at the end of an Egyptian holiday that took me by boat down the Nile to Aswan, to the Temple of Karnak and the Winter Palace Hotel (in which Christie wrote Death on the Nile) in Luxor to the son et lumière show at the Pyramids, reminiscent of The Spy who loved me. It’s a fascinating country and the book is truly evocative of the city. 9. The Face of the Third Reich by Joachim Fest. Not the norm for holiday reading, I would accept but I read this in France as a teenager on a family holiday and it still sits on my shelves today. It is a series of potted sketches of various sections of Nazi society and a number of key Nazis, focussing on their psychologies and written in a lucid and highly readable fashion. Its structure and tone is such that it avoids getting bogged down in the weight of detail that is available but manages to capture some essential truths about Hitler’s regime. 10. The Lost Symbol by Dan Brown. I’m happy to admit that I quite enjoyed Angels and Demons and The Da Vinci Code. I thought they were fun little pot-boilers and I do like all the occulty factoids, even if I do know they are clap-trap. So, when we took a trip to stay with my parents in Normandy a couple of years ago just after mini-Falaise’s first birthday, I took this along to while away a few relaxing hours. I wish I hadn’t. It’s rubbish. More than that, it is lazy, exploitative rubbish. When we came back, I left it behind. Several hours of my life that I will never get back. I like your idea of taking along books that are related to the area in which you are vacationing. Imagine all the awesome literature you could read while visiting New Orleans or the Carolinas? :) Thanks for stopping by my blog -- happy reading! I always take books that are relevent to where I'm going when I travel. I love it, because fiction or nonfiction they make me feel more connected to the place. Midnight is one of my favorite books and I re-read it on a trip to Savannah. Lovely list. I enjoyed reading about your memories of each book. One thing I like to do once I get there is to buy a book related to the places I'm visiting and red them while I am there. For example, I have fond memories of buying "The Raj at Table: A Culinary History of the British in India" by David Burton in Amritsar and reading most of it while travelling by bus from Amritsar to New Delhi, and then finishing it on the train to Agra. Another book I connect to a place is Desert Solitaire by Edward Abbey. I didn't read it while travelling, but just by reading a chapter or two I can re-live my visit to Arches National Park in Utah. Incidentally, if you ever visit Iceland, I recommend "Letters from Iceland" by W.H. Auden and Louis MacNeice. This is a great list. I love that you have given us the memories associated with each of them. I find it really amusing just how many of us have Agatha Christie on our lists. What is it that makes her such a good beach read? Perhaps it's all the lovely warm sunny settings. The Face of the Third Reich - I really wanted to read this book, long time back! Now that you reminded me of it, I'm going to pick it up soon!! Nice list! Other than Poirot, I haven't actually read any of the books on your list. I loved reading all the memories they brought back. If you like a good fantasy novel then I recommend A Game of Thrones. It's worth the hype. Couchpotatocritic - I read some James Lee Burke in New Orleans, which seemed appropriate! Melissa - I've never been to Savannah, unfortunately. Have you read Berendt's City of Falling Angels? Bibliopphile - I've never had the chance to visit Iceland but, if I do, I will certainly take your recommendation. Birdie - Thanks for the comment. I think Christie works so well because it is nice easy plot-driven reading. Just right for when you don't want to have to concentrate too much! Priya - Putting it in this post has also made me want todig it out again and re-read it! Karen - Thanks for the comment. I have been toying with the idea of reading Game of Thrones so I may just do it now. iLuvReadingTooMuch - Thank you very much for stopping by and commenting! Very thoughtful list! Brideshead Revisited is a book I'll never forget. Thank you for all these great ideas. I thought the Da Vinci code was a fun read as well. I always think I'm not the kind of reader that goes for thrillers or mysteries (I prefer chick lit for my light reads), but whenever I read one, I like it. Deb - thanks for the comment! LBC - I tend to go through phases of light reading and heavy reading.